Lorraine has been with Envision Medical Spa for over a year, and is a vital part of the Envision Medical Spa family! As our Managing Director Lorraine looks after our marketing, front end, and staffing. 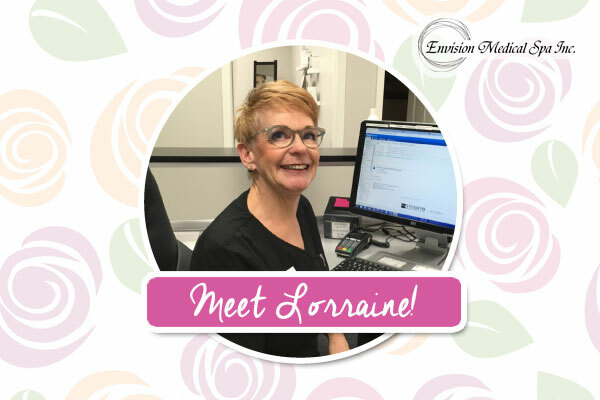 Lorraine loves working for Envision Medical Spa because of the quality treatments we provide to each and every client that walks through our doors. "Women feel so pressured to be young and beautiful! We can give them amazing results and the look they want while still looking natural." With over twenty years of medical field frontend and management experience under her belt plus an impressive resume of other career fields and volunteer boards, we are extremely proud to have Lorraine Weir a part of our team! Lorraine worked for marketing and group sales at Uniglobe Travel - an industry leader in vacation travel, wedding and incentive group travel located in Cranbrook, BC. Cosmetology at Merle Norman and the Hudson Bay. She sat on the Riseup Society board for five years. This amazing organization works to help rid communities of domestic violence and abuse. Lorraine was an avid board member and past President of BC Yukon Canadian Cancer society and Kootenay Regional President. She supported Suit Yourself in Edmonton and overseas companies that provided care for their workers and children. If you're from Leduc then you might recognize Lorraine's boutique Brambles that was formerly on Main Street. Lorraine owned and operated Brambles for six years and loved every minute of it! The boutique offered specialized fittings, wardrobe consulting and featured unique higher end items from Europe and local jewelry from Edmonton artists. The boutique opened in 2012 and earned the honor of Best New Start-Up Business from Leduc County Chamber of Commerce. From marketing to selling lingerie to even selling cars - Lorraine has done it all! For all of your Medical Spa needs please call 780-986-8352 Today!